In this new monthly column the Madcap Woodwright, John McBride, invites both seasoned pro and novice woodworkers alike to stop and reevaluate their perspective on woodworking. Each month, the Madcap Woodwright column will explore issues that encourage you to examine time worn attitudes and approaches to woodworking. 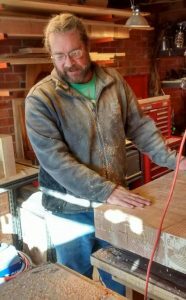 In his first column, John starts by telling the story of how he fell deeply in love with woodworking, starting from shop class in his sophomore year of high school. John is also in the process of building a Roubo Workbench “with a Twist“, and documenting the build in stories and pictures in his column. Part 2 of that build is also included in this month’s column, along with a link to part 1. Make sure you subscribe to Wood News and get the Madcap Woodwright and much more delivered to your inbox each month!